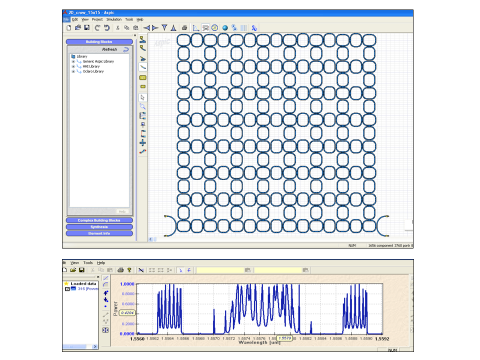 Aspic™ is a fast and accurate simulator for the analysis, the modeling and the design of photonics integrated circuits. In Aspic™, circuits are built as a collection of building blocks that do not require the description at physical level. Its model-based approach allows a high abstraction level, focusing on circuit functionality and performance. 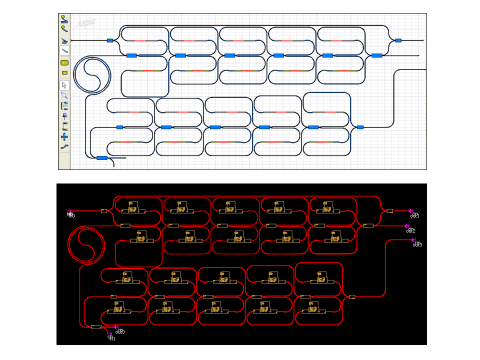 Arbitrary large circuits are conceived, designed, analyzed and translated in mask layouts with few clicks. A rich set of sophisticated analysis tools assists the users in every phase of the project development. AspicPlot is an advanced tool of Aspic, enabling not only to visualize the simulation results but also to perform fundamental post-processing operations and analysis. Aspic can easily import and export data in text and Matlab™ format. Linear and log scale, two independent y-axes, zoom, markers and many other functions are available to support the users. 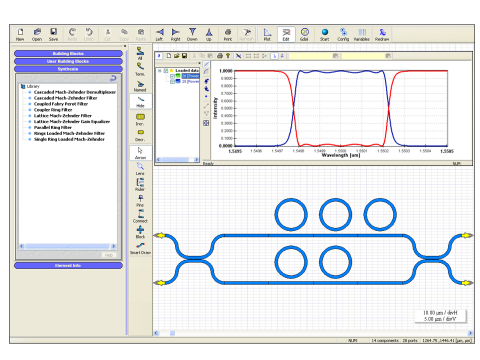 Experimental data and actual responses can be easily loaded and used inside the circuits, to perform realistic simulations, make virtual experiments, compare measurements and simulations, extract device parameters and improve the models of components. 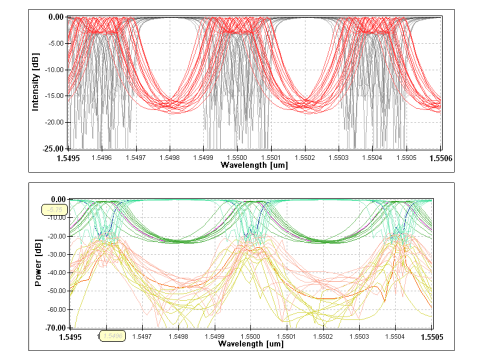 Simulate thousands of building blocks at hundreds of wavelengths in few minutes! The circuit-based approach is complementary to classical electromagnetic vision and ensures efficient and high-speed computation even for large and complex circuits. Input and output waves are available at the accessible ports only as intensity, phase, group delay and chromatic dispersion for both TE and TM polarizations. The circuit schematic can be used for the automatic generation of the physical layout in GDSII format for mask realization. 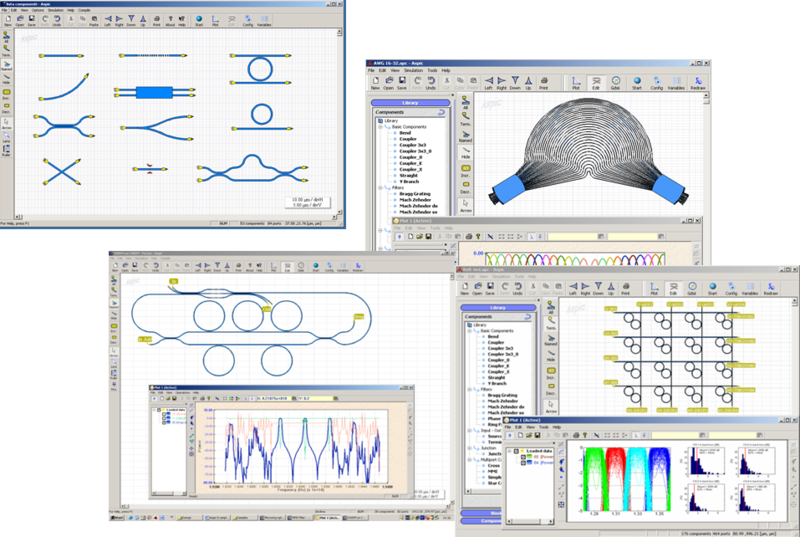 Further, Aspic can exchange circuits with OptoDesigner, the professional parametric mask layout package by Phoenix, NL, avoiding intermediate conversions, preventing errors and saving time. Design Rule Checking process prevents any unphysical and unacceptable layouts. 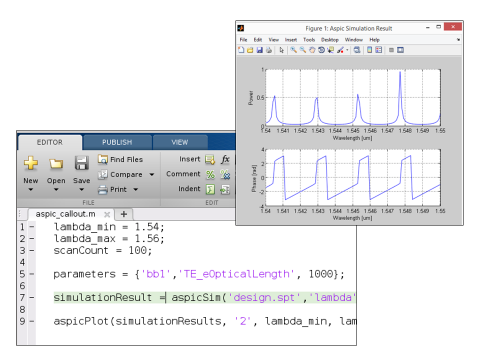 ASPIC is now available as MATLAB® or Python engine. It is possible to combine the powerful and flexibility of scientific scripting languages like MATLAB®, Python with the ASPIC simulation capability in order to extend the analysis. Designers can leverage on the scripting capabilities in order to automate and control the execution on large number of simulations and embed the ASPIC engine in their own functions. Moreover, the results can be analysed and processed with the extensive and widely known set of tools offered by the specific software package. 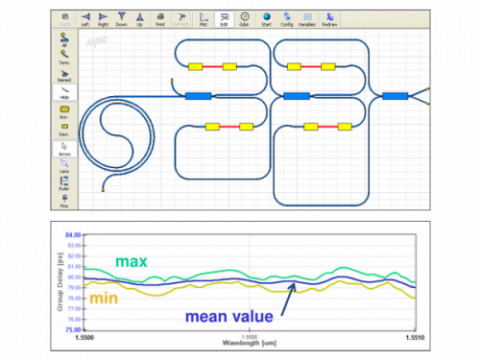 Aspic easily exports and imports simulation results and data from/to MATLAB®. I work like a gardener or a wine-grower. Things come slowly. I didn’t find my vocabulary of forms, for example, all of a sudden. It developed almost in spite of me. This quote portrays at best the creation of a PDK. It evolves, progresses, enriches… it is a sublime blend of electromagnetic theory, circuit modeling, software coding and characterization techniques that only 25 years of experience in the field, the synergy with an excellent university and the passion for multidisciplinary research can generate. The in-depth background of Filarete in combination with the commercial expertise of Phoenix and the access to measurement equipments of the Photonic Devices Labs at Politecnico di Milano are unique! 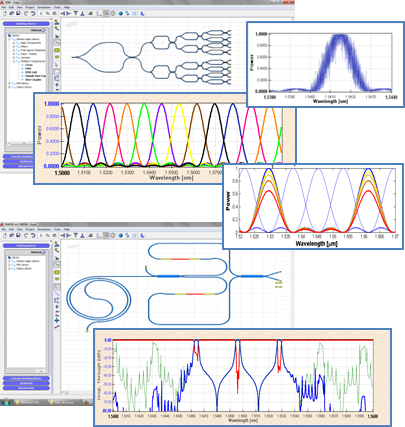 Aspic provides a library of ready-to-use synthesis routines to design high performance, multi-stage integrated optical filters. Cascaded Mach-Zehnder, parallel-coupled or directly-coupled ring resonators are just few examples of the available options. D. Cassano, F. Morichetti, A. Melloni, “Statistical Analysis of Photonic Integrated Circuits Via Polynomial-Chaos Expansion“, Signal Processing in Photonic Communications, pp. JT3A–8, Optical Society of America 2013. D. Melati, F. Morichetti, F. Soares, A. Melloni, “Building block based design of photonic integrated circuits for generic photonic foundries“, Transparent Optical Networks (ICTON), 14th International Conference on, pp. 1–4, IEEE 2012. 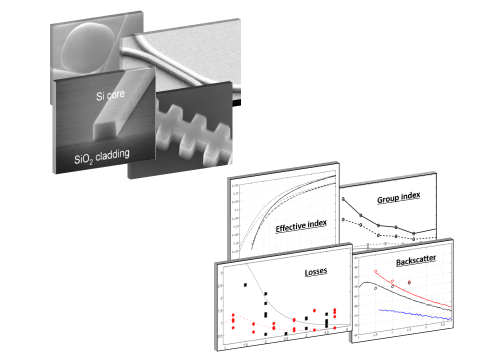 F. Morichetti, A. Canciamilla, C. Ferrari, M. Martinelli, A. Melloni, “Backscattering in silicon photonic waveguides and circuits“, SPIE OPTO, pp. 79430J–79430J, International Society for Optics and Photonics 2011. A. Melloni, A. Canciamilla, G. Morea, F. Morichetti, A. Samarelli, M. Sorel, “Design kits and circuit simulation in integrated optics“, Integrated Photonics Research, Silicon and Nanophotonics, pp. JTuB24, Optical Society of America 2010. Filarete S.r.l. is a company born from the experience matured by the Photonic Devices Group at Politecnico di Milano (Italy) on integrated optics and optical components and devices. Filarete S.r.l. is a founding member of the PDAFlow Foundation. Don’t esitate to contact us for more information about us, or if you need assistance or a quotation. 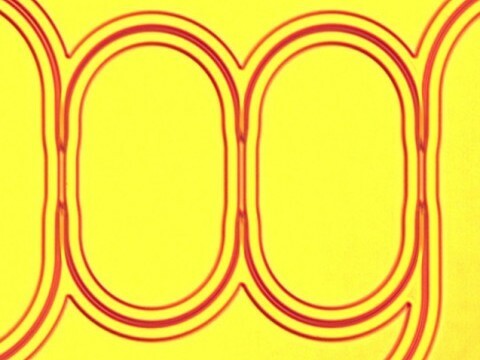 Aspic is also commercialized by PhoeniX BV. Please visit PhoeniX website for more information. 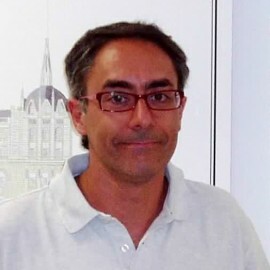 OSA Fellow, he is Associate Professor at Dipartimento di Elettronica, Informazione e Bioingegneria – Politecnico di Milano – where he leads the group of Photonic Devices and teaches the master course “Photonics Devices”. With a background in microwaves, his field of research is in the analysis, design, characterization and exploitation of passive integrated optical devices for telecom and sensing. He has been one of the pioneers of the slow light concept and its exploitation in the linear and nonlinear domain. He is currently contributing to define the new schemes of generic photonic foundries in Europe. In 2008 he founded the company Filarete, for the development and commercialization of the first circuit simulator for integrated optical circuits, ASPIC. He holds 13 international patents in the field of integrated optics and components and he is author and co-author of over 90 publications on the major international journals. 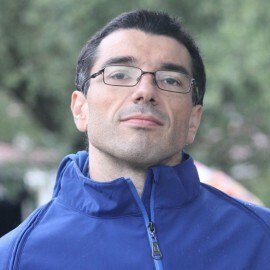 Daniele Melati (1986) is a postdoctoral researcher at Politecnico di Milano. He received the M.Sc. degree in telecommunication engineering in 2010 (110/110) and the Ph.D.
as visiting Ph.D. student to focus on technology and clean-room activities. and assessment of the production processes. He actively collaborates with the company Filarete to the development of the circuit simulator for optical circuits ASPIC. In 2013 he collaborated as teaching assistant to the course ‘Optical Components and Circuits’ at Politecnico di Milano. Since 2009 he was involved in the collaborative project EuroPIC (EU FP7, 2009-2012) and he is currently involved in the projects PARADIGM (EU FP7, 2010-14) and BBOI (EU FP7, 2013-2016). He graduated in physics from the University of Pavia, Pavia, Italy, in 2001, with a thesis on photonic crystal materials, and received the Ph.D. degree in physics from the University of Pavia in 2005 and the Ph.D. in science material from the University Pierre et Marie Curie Paris 6, Paris, France, in 2006, with a work on all optical switching and optical transistors. Starting from 2010, he works on synthetic aperture radar processing and SAR simulation where he develops several software for European and Argentinian Space Agencies. 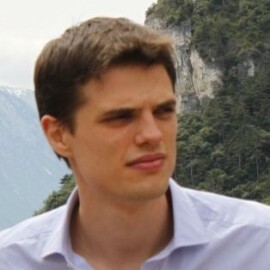 In 2015 he joins Filarete to develop ASPIC an optical circuit simulator. He is the author and coauthor of more than 50 international scientific publications. 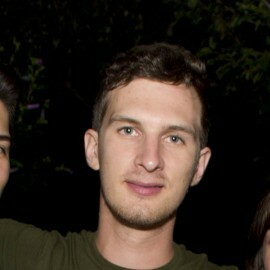 He graduated in Computer Engineering at Politecnico di Milano in 2009. He worked at STMicroelectronics form 2009 to 2013 in the Technology R&D division focusing on internal CAD development and pilot projects. He joined Filarete S.r.l. in 2013 as Software Architect.